Breaking News: Katherine Bacher is an Amazon Best Selling Author! Thousands of hours of hard work. My publisher messaged me as of 10/27/2017 at 7:00am (PST). They sent me the below image. 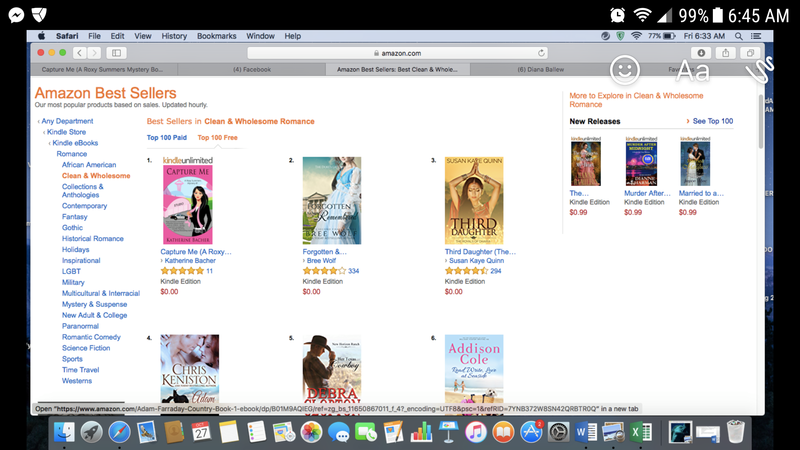 I am #1 in the Clean and Wholesome Romance category. I am OFFICIALLY an Amazon Kindle #1 Best Selling Author! For the first time in my life, I am officially a Best Selling Author. As of this evening, I made it onto THREE Amazon Kindle Best Seller Lists in ONE DAY! The best part of it all… I’m in the TOP 5 of each Best Seller List! How do I describe my emotions from today? I’ll write another blog post after I’ve recovered from the shock. To my husband, Pilot, who has never doubted my abilities from Moment 1, even when I doubted myself. You gave me the confidence to try. I can never be more grateful to have you as a life partner than that gift you’ve given me for 15 years and counting. I love you with every fiber of my being. Thank you for letting me be your person, and thank you for being mine. I am so happy I get to share this with you. To my Mom, who told me we were going out to dinner to celebrate mere seconds after sharing this news with her. Thank you for wiping all of my sniffles away as a kid, for all of the musicals and movies, and for all of the Winter Olympics with Cup o’ Noodles in hand. To my Dad, I wish you were here to see it. I miss you every day. I hope wherever you are, you’re at peace and sharing in this moment with me. To my friends who have supported me, provided a listening ear, given me caffeine, and ignored my tired zombie face. To my family, they’re small words but have so much meaning behind them: Thank you. Thank you to Trifecta Publishing House. You’re an amazing group of people. I learn something new every day from you. Thank you to everyone who has left me 5-Star Reviews. Thank you to everyone who has laughed, cried, cringed, and cheered with each story. To everyone who doubted me. To those who physically and emotionally bullied me. To my racist director of the Pacific Northwest Children’s Choir. Even after auditioning with a combined sinus and ear infection, I still managed to perform well and was accepted to join. You made every day after that a living hell. You singled me out each practice to specifically remind me I was a worthless piece of garbage, and didn’t deserve anything good in life. I always thought it was me. That I wasn’t good enough. That it was for my friend would forget her music book and I’d lend her mine. You assumed I always forgot mine. I took the blame because I didn’t want her to experience the same wrath I received from you. Please know that I never forgot my music book. I was responsible. I was careful. I didn’t need it for choir practice anyway because I practiced at home every day after my six hours of homework for additional hours to be perfect for you. I hoped that my hard work would earn your respect. Not understanding that your blind hatred of me was a deeply rooted, rotted thing within your soul. I was 9 years old. Thank you for turning hard work and effort into a useless, fleeting goal. I’m now here to tell you: I am not worthless. Trying to earn the respect of a horrible human being is. Thank you for teaching me a lesson in not wasting my short time on this planet by filling my days with terrible people. Those who broke my heart in either a romantic or platonic sense. To anyone who has ever hurt me. Thank you, daily life, menial tasks, and my regular day job. You keep me humble. Even after publishing this blog post, I will need to get to bed soon. For tomorrow, I will still have to wake up early, pack my sack lunch, commute to work, complete my tasks, pray my paycheck comes in on time since it will be the last Friday of the month and hope it will be valued at more than I think it will be, buy a pack of toilet paper on the way home, and take the pups on their afternoon walk. CLICK HERE to get your copy of Capture Me (A Roxy Summers Mystery #1) on Amazon Kindle FREE from Oct. 26-30, 2017! It’s a BEST SELLER! Did you know? CLICK HERE to get your copy of Crush On You (A Roxy Summers Mystery #2) on Amazon Kindle for the discounted price of only $1.99 from Oct. 26-30, 2017!